Beck // Call. (c) 2013 Wizards of the Coast. Though it seemed as if Gatecrash’s prerelease was no more than a few weeks ago, this weekend signaled the launch of Dragon’s Maze prerelease events nationwide. As always, vendors and local gaming stores alike had their hands full while organizing and running these events. A lot of coverage around last weekend’s prerelease consisted of favorite draft picks, and set-constructed evaluations. I’ll spare you the common banter that’s excessively splashed about in the wake of a new set release and get down to the point I care about most: makin’ that cash money via proper trade habit; particularly, arranging profitable buylists as an event organizer. Preparing for a prerelease, from the perspective of an event organizer, can be stressful; perhaps even overwhelming at times. There are many variables that need to be calculated and allocated properly for an event to run smoothly: availability of products, seating limitations, competent judges, timing between flights, adequate air circulation, etc. So, those are the basic components of running a successful event – but what about a profitable one? Besides the obvious profits drawn from sales of food, drink, accessories, and entry fees, what are good ways for event organizers to profit during prerelease events? The answer is painfully apparent for those of you who haven’t guessed already: create a buylist for the new set. Consider every large TCG superstore – like CFB, SCG, T&T, ABU – do they not buy new set cards at their prerelease events? Yes, yes they do! However, some of these vendors do not post buylists online prior to set release; I assume this is done to avoid clutter of their postal operations and to allow their employees maximum focus while gearing up for the release. Creating a buylist that won’t net you investment loss seems like a simple task, perhaps. I assure you, there is a considerable amount of complexity when deciding what types of offers one should make when designing a buylist. Understand that pre-order prices are speculative and predominately based on consumer demand/impulse, rather than on market saturation, competitive application and non-fiscal consumer availability (barter/trade). There has been no amount of competitive play with these cards to solidify their price tags. Many of these cards will flat-line in price after 2-3 weeks after set release. For instance, look at Duskmantle Seer from Gatecrash – his preorder price on SCG was $19.99 on Feb 1st, but dropped to $5.99 on March 1st – the card lost 70% value in only a month. Even if you had bought the card for $10.00 (50% of the pre-order price), you would still lose $4.00 (-40% ROI) for every copy that you were unable to sell within 4 weeks. Duskmantle Seer as of May 1st, 2013. My system is solid and brings me great turnaround sales every week. However, these are cards that have been played, battle tested so to speak, and because of this their values are respectably steady. When gearing your buylists for prereleases, always remember that most cards flat-line and lose about 20-30% on average in value. Unless you can resell the stock you acquire within 2 weeks of release, make sure to accurately inventory the cards you purchase and set limits for each. Avoid 99% of commons and uncommons, go for the throat first and worry about the scraps later; chasing rares and mythics is where the money is. Always take the time to familiarize yourself with new cards by looking at the set spoilers online. Do your best to identify the cards that will see play within multiple formats, or redefine a single format – acquire as many of these cards as possible! 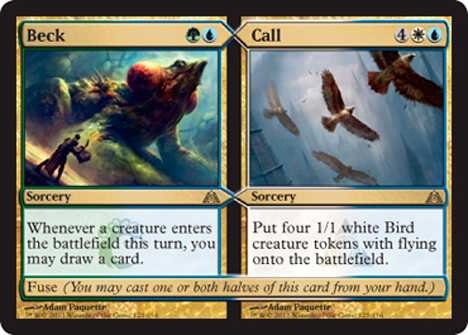 As for the remaining cards in the set, aim for a playset or two of each. So, now you know what you’re hunting for; it’s time to arrange the pricing. As I said before, the system of buying that I provided does work well, but not with prerelease singles. My rule of thumb is to offer 50% presale price for any card at prerelease. If I speculate that the card is going to rise, I may offer upwards of 70% for certain cards such as Voice of Resurgence. Some losses are hard to foresee (Duskmantle Seer), but limiting the amount you buy of ‘iffy’ cards can really pay off in the long run. I get all of my pricing information from MTGprice.com – as it averages the market cost across multiple vendors to provide the most accurate price. Below is a copy of my buylist for Dragon’s Maze. Feel free to print it out as a cheat sheet/quick reference when buying cards at your LGS, or from friends! I hope this list helps you throughout the week, and especially on Friday when Dragon’s Maze releases.